Geneva: The Second Preparatory Committee for the 2015 Review Conference of the Parties to the Treaty on the Non-Proliferation of Nuclear Weapons (NPT) opened on Monday in Geneva against the backdrop of rising nuclear tensions in the Korean peninsula and Iran's nuclear enrichment programme. 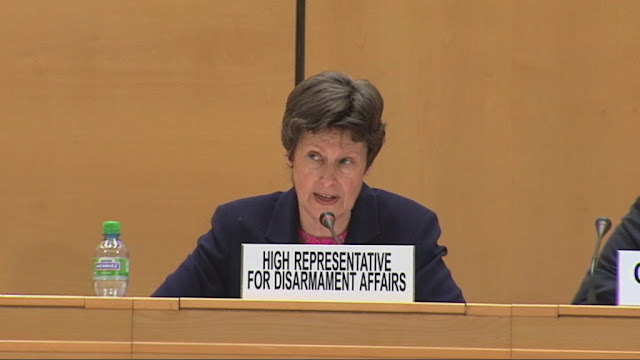 Angela Kane, High Representative of the United Nations Office for Disarmament Affairs, opening the meeting warned: "We have also all witnessed in recent months a deterioration of the security situation on the Korean peninsula, which has featured threats from the People's Democratic Republic of Korea to resume missile tests and even to use nuclear weapons. We see signs of an arms race in South Asia involving fissile material production, and the competitive development of both nuclear-capable missiles and nuclear weapons. We see that sustained diplomatic efforts to encourage Iran to fulfil its responsibilities under Security Council resolutions have so far failed to yield a resolution of ongoing concerns over certain of its nuclear activities." Speaking on behalf of the European Union, Jacek Bylica, Principal Adviser and Special Envoy for Non-proliferation and Disarmament, said the EU was "deeply concerned" about Iran's nuclear program. He said: "In the case of Iran, the EU remains deeply concerned about its nuclear programme and continues to be engaged in renewed efforts aimed at finding a negotiated solution." And addressing concerns of DPRK's nuclear ambitions, he said: "The EU strongly urges the DPRK to abandon all its existing nuclear and ballistic missile programs in a complete, verifiable and irreversible manner. We strongly condemn the DPRK's aggressive rhetoric, including repeated threats of the use of force." The Geneva preparatory committee meeting will focus on a range of issues for the next two weeks to prepare the agenda for the 2015 Review Conference which will take place in Geneva. The official nuclear weapon states— the United States, Russia, Britain, France, and China who are known as P5 - are required to implement measures under the treaty to "cessation" of the nuclear arms race, and complete nuclear "disarmament".